With the addition of the CSP-30TS-011 high performance Radio Frequency probe, ECT adds to its industry proven high speed test interface portfolio. The probe incorporates several innovative features that result in superior performance and ease of use. The CSP-30TS-011 was specifically designed to contact PCBA board features such as: test pads and vias. With a bandwidth in excess of 20 G Hz @ -1dB the CSP-30TS-011 offers outstanding signal integrity and measurement capability. 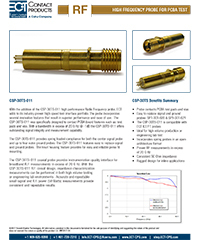 The CSP-30TS-011 coaxial probe provides instrumentation-quality interface for broadband R.F. measurements in excess of 20 G Hz. With the CSP-30TS-011 R.F. circuit design, impedance characterization measurements can be performed in both high volume testing or engineering lab environments. Accurate and repeatable small signal and R.F. power (50 Watts) measurements provide consistent and repeatable results.